We has attained the Star Merchant Award again for being an outstanding company in Market Leadership and Service Excellent. Automotive gearbox specialists KATC Autotrans is introducing its new GearLife extended warranty, offering car owners a peace of mind. The automatic transmission – or more commonly known as gearbox – is an often overlooked car component when it comes to servicing and maintenance. When the car begins to show signs of age and the car’s driving performance becomes sluggish, we tend to pinpoint the problem on the car’s engine. This is understandable, considering the engine is the heart of the car, and perhaps the most obvious and common component in a car that will throw up problems. However, what many drivers often overlook is the fact that the car’s gearbox is also vital, as it is one of the important components of the car, responsible for driving power generated by the engine to the wheels. Therefore, proper and regular maintenance of your car’s gearbox is crucial to maintaining and optimising the car’s performance. Who is KATC Autotrans Pte Ltd and what services does it offer? KATC Autotrans was founded in 1993 by Raymond Khang, and was one of the first workshops to specialise in gearbox repair and servicing. 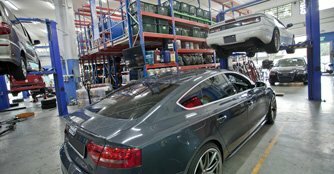 Since then, the company has established and reputed to be one of the key players in the the industry, doing repair, restoration, rebuilding and servicing of automatic transmisssions. KATC Autotrans offers a complete service for automatic gearbox problems, from a simple diagnostic check to repair, rebuilding, restoration and servicing for all types of automatic gearbox. With many years of hands-on experience and technical knowledge and expertise, KATC’s mechanics and gearbox specialists are confident and well-geared to offer comprehensive repair and servicing for all types of automatic gearboxes. What makes KATC Autotrans different from its competitors? Mr. Raymond Khang has been a member of the Auto Transmission Service Group (ATSG), USA since 1995. The ATSG Co (USA) is a private company incorporated in the USA that proactively organises and conduct seminars, trainings and exhibitions to promote the technical knowledge of automotive transmission and update its members of the latest news in this industry. Accordingly, one of the key aspects of KATC Autorans’ service is to educate its customers (car owners) on the importance of gearbox maintenance and best driving practices to reduce gearbox wear and tear, on top of its full range of gearbox repair services. This year, KATC Autotrans Pte Ltd will be launching a new extended warranty product, which will be known as ‘GearLife’. Mr. Raymond Khang highlights that many drivers and car owners are unaware of the importance of gearbox maintenance, and this extended warranty product will offer drivers and car owners a peace of mind, and not having to worry about their car’s gearbox problems and cost of repair. GearLife is an extended warranty that provides a better and more comprehensive coverage for wear and tear of the car’s automatic gearbox. Currently, under the Lemon Law provisos, any vehicle purchased from a car dealer will comes with a six-month warranty coverage. However, while working with the Consumer Association of Singapore (CASE), Mr. Raymond Khang has witnessed a lot of controversial cases between car dealers and buyers. Often, when it comes to gearbox problems, it can be difficult to determine when and how defects may have developed due to the complex structure of the gearbox, with over 800 spare parts and components. To better deal with such potentially controversial issues, KATC Autotrans have set up the GearLife extended warranty, offering comprehensive coverage on any type of gearbox issues that occur during the warranty period. GearLife is a one-year extended warranty that is pegged to the Lemon Law (six months Lemon Law plus six months extended warranty), which will cover any repair, restoration, rebuild or replacement of an automatic gearbox and its related parts. GearLife is also underwritten by Ecics Credit Insurance Ltd. and accredited by CaseTrust, offering customers a peace of mind. KATC Autotrans is the appointed authorised workshop to fulfil the GearLife extended warranty service and administration. The company is presently working with trusted motor workshops and car dealers islandwide to offer the GearLife product. When buying a car from a car dealer, GearLife will be automatically included in the package. Any other car owners can also purchase GearLife as a one-year extended warranty, and interested parties must send their cars to KATC Autotrans for a pre-acceptance check. Introducing GearLife, the latest and most comprehensive warranty program for your automatic transmission. GearLife covers repair, restoration, rebuilt or replacement of automatic transmission gearbox and its related parts, so you can now enjoy driving with a peace of mind. GearLife is set up to provide a better and more comprehensive warranty program that includes coverage for wear and tear. Our business has a performance bond capped to protect the customers against unresolved dispute in accordance to the CASETrust – Auto Allied accreditation scheme. With the advent of new automotive technologies, coupled with the high prices of brand new cars in Singapore, motories are now keeping their cars for a longer period of time. A gearbox usually has a lifespan of about 3 years or 100,000km before problems such as jerking or lost of power arise. A typical repair / replacement cost for such cases can range from $2000 to $20,000. For this reason, an extended warranty like GearLife will be crucial in keeping repairs and maintenance cost to a minimum. KATC Autotrans Pte Ltd is accredited for Bizsafe3 in September 2015. Our company will keep up towards a safe workplace.